Rich in Tryptophan and organic magnesium as well as B vitamin complexes. Designed to help calm “hot headed“ horses and maintain a positive mental state during the competition period. of excitation. 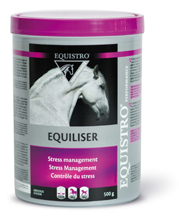 Equiliser contains a readily assimilated organic magnesium, L-Tryptophan, and key B complex vitamins. EQUILISER is an important combination of L-Tryptophan, vitamins B1 and B6, niacin and organic magnesium in a formulation designed to meet the nervous system requirements during important periods of stress. Equiliser is rich in L-Tryptophan, destined to maintain the balance of the nervous system during periods of stress or to help return a “hot headed” horse to a handlable state. Administer in feed for a duration of 2 to 4 weeks. Start to administer at least 2 days prior to an unusual event. It is recommended that a specialist‘s opinion be sought before use or before extending the period of use. Below are some recent questions we've received regarding Equistro Equiliser For Horses, including answers from our team. Can this be fed for longer periods than 2-4 weeks? I'm looking for something longer term. My horse needs something everyday and not just competitions. This product is safe to use every day for an on-going effect. It might become less effective as time goes by but you can try it and see how things go. You should bear in mind of course the other effects of the main food used, the exercise regime and the day-to-day management. All of these along with feed supplements can help.